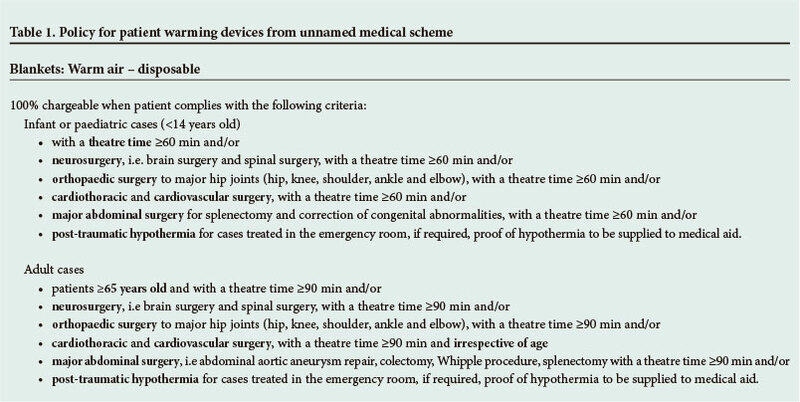 To the Editor: Recently it was brought to the attention the Trauma Society of South Africa (SA) and the Emergency Medicine Society of SA that a certain unnamed medical scheme has produced a document that limits the use of patient warming devices in the care of people covered by that particular funder (Table 1). We, as senior representatives of a number of relevant professional societies, are concerned that the recommendations of this funder will be adopted by other funders and that this will place patients at risk of increased morbidity and even potential mortality, since it is well known from recent literature that maintenance of a core temperature of around 36.5°C is associated with improved outcomes. More importantly, we have noted that temperature regulation is inadequately addressed in the National Core Standards and therefore with these two issues at hand we decided to undertake a literature review and propose a best-practice guideline to enable clinically relevant indications for the use of temperature regulation practices and devices. The resultant review article is published in this issue of the SAMJ so as to effectively disseminate the important information about this issue to South African healthcare practitioners.